Playing a DVD on a Mac is sort of simple thing. Insert the DVD into your disc drive... oops, you don't have one. The arrival of MacBook Air in 2008 marks the era of Mac DVD drive going dead. Most modern Macs ditch away DVD drives in order to get slimmer, thinner and lighter. So if you have your own MacBook Pro/Air Retina or iMac 5K and wanna play DVD movies on Mac computer, what would you do? Have you ever faced with the problem of DVD won't play on Mac? Have any good idea? Well, I would appreciate it if you are willing to read and try the solution - to Rip DVD to Mac. How to Rip DVD to Mac? Need Mac DVD Ripper to Help? If you haven't tried this way before, you might have no clue about how to copy DVD to Mac computer. Let me explain that clearer. To rip movies on DVDs to Mac means to get DVD content off DVD disc to digital video format that Mac computer accepts to playback with media player. And to ensure successfully rip DVD movie to MacBook, iMac, you absolutely need a professional yet high-end Mac DVD ripper to render help. Here the well-reputed MacX DVD Ripper Pro is the greatest choice for you to rip DVDs to Mac. See, it can get the DVD movie off the plastic cell to the digital file format you need for your MacBook, iMac 5K Retina, etc. Removing any DVD encryption tech and ripping DVD to Mac supported MP4, MOV, M4V are downright a piece of cake; and copying DVD to Mac with ISO image or MPEG file format is another simple yet meaningful thing this DVD ripper Mac software can do for you. With this Mac DVD decrypting yet ripping tool, you are allowed to play DVD on MacBook, iMac without any USB Super Drive or Remote Disc involving and worrying about the region code stuff. How to Convert DVD to Mac with Classy DVD Ripper Software for Mac? 1Import DVD by Clicking "DVD Disc" or "DVD Path" button. Free download the DVD ripper for MacBook iMac and fire it up on Mac computer. Click "DVD Disc" or "DVD Path" button to load the DVD on your MacBook or iMac 5K, etc. With the help of Mac DVD ripper, you can select Mac general video format like MP4, MOV, M4V, or choose iTunes, MPEG, ISO Image, MKV, MP3, etc as output format. Optionally, you are also free to convert DVD to iPhone 7/Plus/SE/6S/6S Plus/6/6 Plus, iPad Pro, iPad Mini 4, iPad Air 2, iPod Touch, Samsung Galaxy Note 7/S7 edge, Sony, Microsoft, Google, Blackberry, etc. 4Start Ripping DVD to Mac (MacBook/iMac). Click the "RUN" button to start ripping and copying DVD to Mac computer (Mac OS X macOS 10.12 Sierra supported). 1. For advanced users who desire to customize their DVD movies can free adjust DVD movies via parameter settings like video codec, audio codec, Bit Rate, frame rate, aspect ratio (4:3 to 16:9), resolution (720P, 1080P), etc. 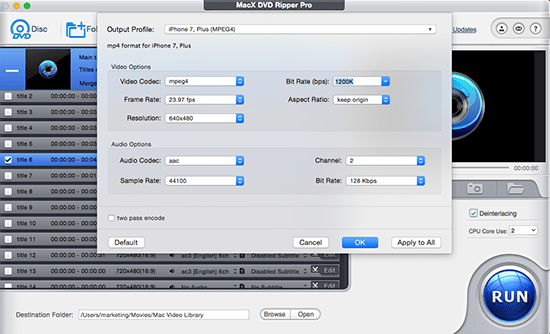 And if you aren't familiar with these parameters, click "Default" to let this Mac DVD ripper set for you. By the way, in case you wanna improve your output DVD movie quality, please tick on High Quality Engine, Deinterlacing modes to boost your DVD quality. 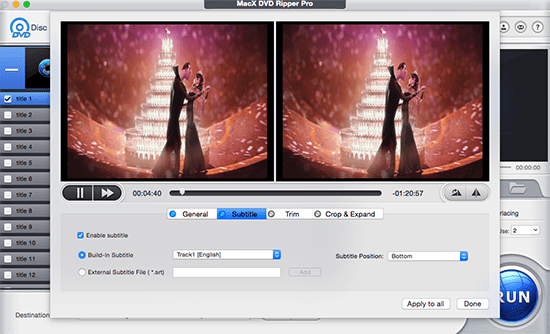 One more thing, no matter which profile you select, you can also use a slider to set this DVD ripper Mac tool to work at its highest quality settings but slowest speed or compromise a little image quality for a faster rip - or anywhere in-between. 2. Besides the powerful DVD decrypting, copying and ripping features, this DVD to Mac ripping software also provides you with another amazing bonus feature-free DVD editing function. See, you are the master to decide what kind of subtitles you want to watch: the original built-in DVD subtitles or add external SRT subtitles into movie; all depend on you. Plus, you can also take control on the DVD video size by applying its trim/crop feature, which lets you cut off video clips by setting the start/end time and crop frame size to edit out any unwanted borders to get just what you want with suitable file size. Big News: the DVD ripper's sister called MacX MediaTrans is also worth your attention, helping you transfer converted DVD movies from Mac to iPhone iPad and more devices for on-the-go watching. And you can use it to transfer photos from Mac to iPhone or sync music, video, iBooks, ringtone, iTunes U, etc. between Mac and iPhone iPad, as well. ［Alternative］How to Digitize DVD to Mac with Free Media Player VLC? To hassle-free rip DVD to Mac so as to play DVD on Mac with ease, the household name video player freeware VLC can also reach this goal. Can't believe that? Well, just read on, plz. VLC player, you might have an acquaintance with its solid knack in DVD playback. But actually, it's not limited with that feature. This free video player can also make a copy of DVDs on Mac. Ok, now let's go straight to the subject to see how to rip DVD to Mac with Videolan VLC. 1 Get your VLC player run on Mac computer. Insert the DVD you want to rip onto your Mac and then press "Media" at the top left corner of the main window, then choose "Convert/Save..." button. Tips: Currently, not all the commercial DVDs VLC can rip on Mac, which means the latest Disney Sony DVDs encrypted with DRM, CSS, etc., VLC would fail to read out their correct title, let alone DVD ripping. 2 Once the Open Media Window appears, hit on the "Disc" tab. Check DVD and select the starting position by choosing the title and only record a specific chapter on the DVD. Then hit Convert/Save. 3 Click the "Browse" button to save your converted DVD movie. 4 Once you finished the settings, hit "Start" to start to rip DVD on Mac with VLC player. After a few minutes, you can get the converted file and play on your mobile devices. 1. VLC isn't updated to be compatible with Mac OS X El Capitan 10.11 so that if your Mac computer is running on Mac OS X 10.11 or 10.12, please resort to VLC alternative for Mac DVD ripping. 2. If you install the VLC 2.0 on your Mac, you will notice that your Handbrake won't rip DVD to Mac anymore. 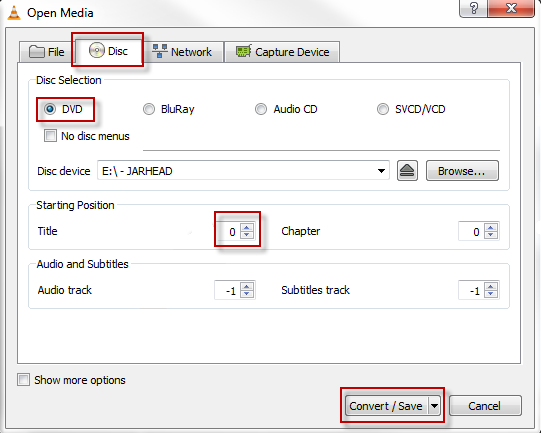 Check the solution to solve Handbrake VLC2.0 problem in DVD Ripping. On top of ripping DVD on Mac to play DVD on a Mac without a DVD drive, you can also try on play a DVD on MacBook iMac with external DVD drive. Below shows you the common two ways. Apple sells a standalone external DVD drive for $79, with a USB sticks, which connects to a iMac 5K Retina, Mac mini, MacBook Pro with Retina Display or MacBook Air. With this USB external DVD drive, you can also play DVD on a Mac computer without having to rip DVD to Mac. You can check the best DVD player for Mac OS X. Check the troubleshootings to DVD player no sound problem. 1. Open System Preferences on the your Mac with the DVD drive and click on Sharing. 2. Tick the lock icon and enter your admin password. 3. Opt for DVD or CD Sharing. Note that this doesn't work for copyright protected DVDs. Notice: We only advocate using this top Mac DVD ripper to rip and convert DVDs for legal personal use, instead of illegal reproduction or distribution of copyrighted content. Please obey your local DVD copyright law before doing it. DO NOT do harm to others' lawful rights and interests. Guide you to rip DVD to USB Type C/3.1/3.0/2.0 drive with original quality untouched within four steps. You are free to copy DVD to USB drive on Mac and Windows in digital video format like MP4, MOV, AVI, M4V etc. 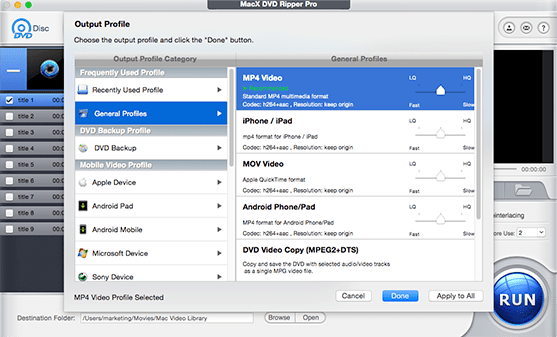 MacX DVD Ripper Pro is the ultimate choice to rip DVD to Mac MP4, MOV, MKV, AVI, FLV, etc so as to play DVD movies on Mac without DVD player or DVD drive. Hyper-threading tech and multi-core CPU utility gurantee you a 36X real time faster speed.